Sony's new RX10 camera just got announced. It's called the Sony RX10IV and it looks like everything I wanted. This is a photo of the RX10iii, one of the best small sensor cameras I have ever used. I just read the announcement of the launch of the RX10IV on Digital Photography Review. It's the one time I hope DPR just goes insane with their product coverage as this is a product that makes sense and one for which I'll gladly line up to hemorrhage cash. There weren't many things I didn't like about the previous generation. The only one I can think of right off the bat would be focusing speed and sure-footed AF lock on to the longer end of the lens. Especially so in video. I haven't checked the specs (extensively) on the new camera but would also love to be able to "punch in" more than the current 5x times magnification in video in order to really nail focus when in manual mode. The lens is the same 24-600mm equivalent Zeiss lens and the camera continues the full frame read, non-binning 4K video performance. The video is actually down res'd from a 5K capture! I found the handling and post processing performance of both 4K and 1080p video to be class-leading and the combination of all the features and performance metrics of the RX10iii to be superb. If this camera focuses better and locks focus quicker; especially in video, then I'm really to throw down money for my copy. (But I want to try it out at a bricks and mortar store before tossing around that kind of money...). Why do I like the most recent RX10xx camera models so much? Hmmm. That's easy. The RX10-3 is an amazing still photography camera. The 20 megapixel sensor makes beautiful files when shot at 80, 100, or 200 ISO. Workmanlike files at 1600 and still decent/usable files at 3200. The image stabilization in that camera is rock solid for photography and 1080p video. Not quite in Olympus territory but as good or better than systems costing thousands more... The all encompassing lens is an "as good" or better than decent replacement for a bagful of most interchangeable DSLR lenses and has more useful reach than just about any lens available under $5000 for Nikon or Canon. Or Sony A7 series cameras. And it's foolish to discount the usefulness of a great, built-in lens; not having to change lenses means no dust bunnies, no sensor damage, no fumbling in the dark to effect the change, and much less to carry around. You know, the difference between two weeks of shoulder battering drudgery or a real vacation. If that was all there was to the RX10-3 it might seem expensive for a one inch sensor bridge still camera but the camera is capable of so much more. It's one of the best fully capable video cameras/systems you can get under $2,000. It's capable of beautifully detailed 4K files and, unlike other cameras in the Sony line up, I've run the camera for multiple segments of 29 minutes duration, with only seconds of delay between the segments, without any indication of overheating. You might think of bridge cameras as "amateur" but then what other "amateur" video camera comes with a full S-Log codec and a the ability to configure its video files in many more ways (knee, black level, gamma, etc.) than just about any other multi-use camera on the market? 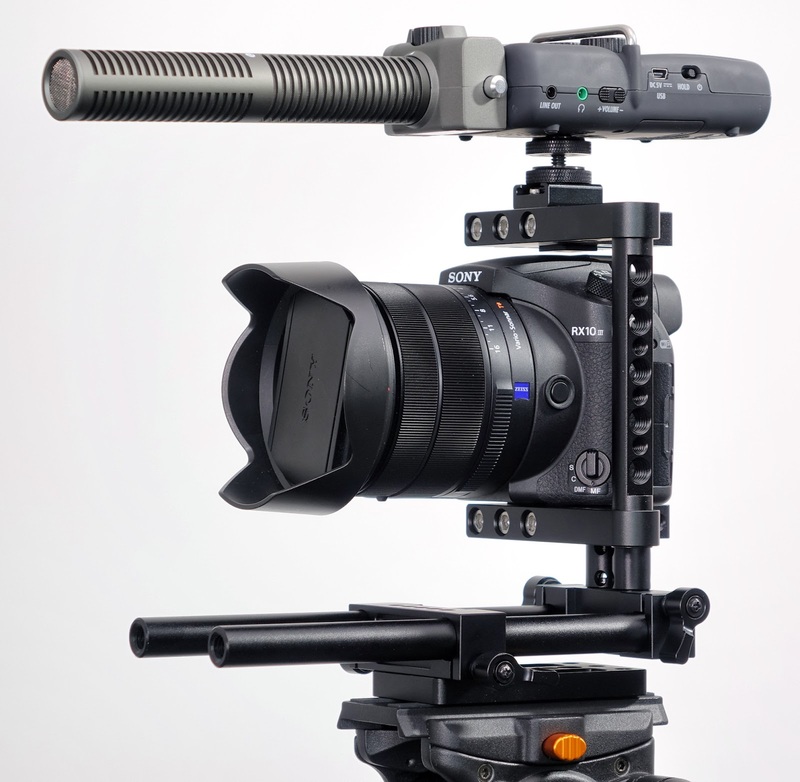 So, nearly full frame 4K at 30 fps, complete with S-Log, and the ability to write the 4K files to Pro Res files via a clean output HDMI connection to an external recorder like the Atomos Ninja Flame. Wow. And of course there are still microphone and headphone connectors, and very clean microphone preamplifiers. I've used the RX10-2 and 3 to make video in downpours, in 100+ plus heat and in the dark of a theater and the camera has never faltered. In 2016 I used the RX10-2 and RX10-3 on enough projects that the jobs I used them on (sometimes exclusively) contributed about 25% of my fee income. So, why would I want to upgrade to the latest model; the RX10-4? I'd do it for the phase detection AF capability that was added in the new model. Apparently it uses the same processor for AF as the new a9 camera. It focuses twice as fast as the current model and locks in (according to Sony) focus quicker and at lower EV levels. The PD AF has been well proven in the a6300 and a6500 models as well. No more dicey focus at the long end of the lens. While I often give in to reckless hyperbole when I'm slamming around on the keyboard I believe that this new camera could provide a single tool that would be able to do most of the professional video and photography assignments most photographers will encounter in day-to-day business. Yes, $1800 is expensive if you consider comparing it directly with a larger sensor camera body. But you should really be comparing it with a whole system of lenses, a stand alone, 4K video camera and a super fast camera body. It's a camera that can replace thousands and thousands of additional dollars invested in arcane photo stuff. I'm not saying anyone else needs to rush out and buy one immediately or their career will come to a grinding halt. This may be only really cogent to my uses. But I'm certain it will be a most useful tool. The camera is not as big or as heavy as any DSLR anywhere once equipped with an equivalent lens (if there was one....). The price is not just for a camera body with a small sensor but for an entire system that is capable of doing a combination of applications open to no other camera/lens system on the market. If you just broke the price in half and charged $900 for the body and $900 for the lens then perhaps it would be easier for the cognition-challenged to understand the overall value. And, since it only comes in a kit you save a dollar!!! The RX10IV might not be perfect. It's too big to fit in the front pocket of your ever-tightening Jourdache jeans. The video specs aren't as good as those on the GH5. The dynamic range of the sensor isn't going to go toe-to-toe with the Nikon D850. But if you need to toss some plastic wrap over the top and video tape a raging flood in the middle of a driving rain storm and then walk away with near perfect 4K video, and then turn back around and make a technically great photograph of an electric transformer blowing up on top of a utility pole one hundred yards away ---- then I think you may have found your camera. You might not need one. You might not be able to afford one. But that doesn't mean the camera isn't pretty darn amazing. And very useful to people who need what it offers.